Breast cancer survivor and Royals Mom Lorraine with son Jody and members of the foundation Lloyd Chambers. 2016 will mark the 6th annual Royals Baseball for Breast Cancer game. 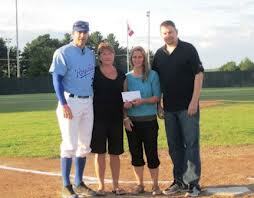 This summer the Royals will play host to the Moncton Fisher Cats in Saturday Night Lights action on July 30th at 7:00.